Empire Cookies are usually made with Sugar Cookies. Mine use Shortbread instead. I was inspired after I attended an event with the Scottish Embassy in Toronto. I tried one of their Empire Cookies that used shortbread and was instantly hooked. This is my version of that cookie experience, much easier to make than rolling out the sugar cookie dough. And extremely easy to eat, I have to hide them from my husband and son. If you watch Cityline, I demmed this recipe on the Baking Special, here’s the link to the video. In medium bowl, sift and then whisk together flour and corn starch. Whisk in salt. In a separate bowl, using a stand mixer on low then medium speed or by hand if you are old school, beat butter and sugar until fluffy. Add flour on the lowest speed until the dough comes together. Gently pat dough into oblong block about 2×1-inch thick. It will be about 12 inches long, approx. Cover with parchment paper and refrigerate until very firm, at least 2 hours or overnight and up to 2 weeks. Remove cookie dough from the fridge, using a very sharp knife, cut into 1/8-inch slices. Place slices of cookie dough on prepared cookie sheet. Bake in preheated oven until edges of cookies are golden brown, about 15-17 minutes. Let sit on the cookie sheet for 2 -4 minutes, gently remove and cool on a wire rack. Remember to use the inside of the cookies, the outside is the show side. When completely cooled, spread a tiny amount of seedless raspberry jam onto the inside of one cookie. Lightly press the second cookie inside on a top. Let set for at least 1 hour. Make icing: 1 cup icing sugar and ½ tsp pure almond extract + enough water to make a paste. I place waxed paper on the counter under the wire rack for an easier cleanup. Using a small knife or spoon, ice ¼- ½ of the cookie at the end. Place back on wire rack until the icing is set. Store in a container with a tight-fitting lid between sheets of parchment paper. Eat in three days or freeze for up to 4 weeks. 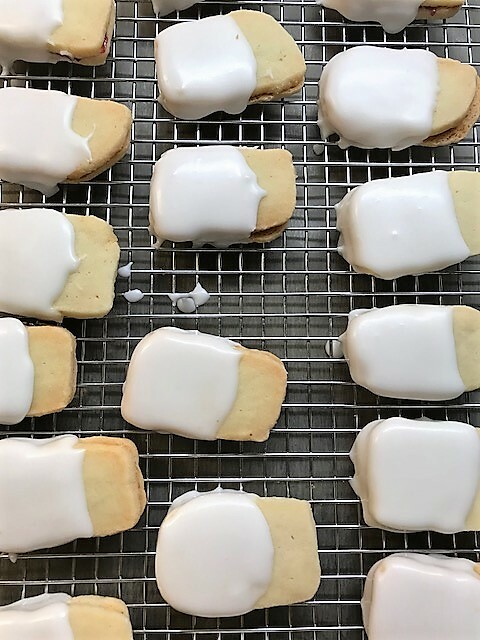 The shortbread recipe is adapted from a winning recipe in a Gay Lea shortbread contest, sent in by Lisa Mitchel of St. Thomas, Ont. You can adapt the dough to any shape; I like to bake them in slices. Mairlyn, you’ll nailed this one! These are incredible!! Melt in your mouth. Perfect shortbread. And easy! Thank you for this new addition to my Christmas baking list. Merry Christmas and Happy New Year! I’m so happy you loved them. If you don’t have a stand mixer is this still doable? slightly harder, but totally doable. You’ll need elbow grease! So glad to see you are using your Moms apron, makes everything soooo much better. Love your recipes, I am trying these ones! Wearing my mom’s apron, brought me joy. Bless your heart for letting me know. My baking is like my kids, I want you to love them! I’ed like to make a cookie Christmas Tree. I bought cookie cutters from Avon that are shaped like stars and they are many different sizes starting from pretty small, say one inch all the way up to 7 inches I presume. So when stacked it will look like a tree! I wonder if you could suggest a good recipe to do the cookies, maybe shortbread but it has to be one where the smaller ones won’t burn or do you suggest I take the smaller cookies out of the oven first? Sorry for the late response. For next year, I would use a sugar cookie or a gingerbread recipe. I think shortbread would be too soft a cookie for staking.